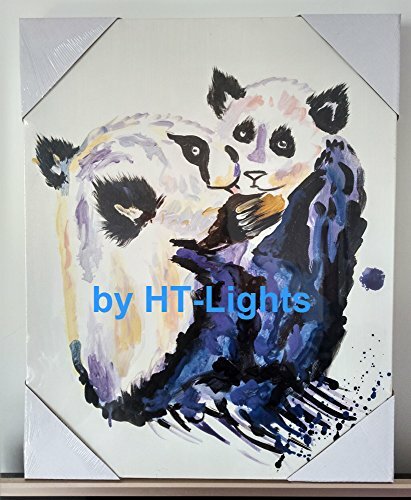 HT-Lights @ Amazon oil paintings are carefully checked by professional QC before shipping . Hand painted oil paintings on canvas painted by HT-lights professional artist with years of oil painting experience. A great gift idea for your relatives and friends. Hanging Hardware Included. Hand Finished & Ready to Hang. really cool. This is not a print, it's Hand Painted Panda Animal Oil Painting the artist produces. Great ideas of framed art for kids are trains, cars, trucks, sports, ballerinas, princesses, animals, angels, dragons, dinosaurs, even space. If you have any questions about this product by Panda Animal Paintings, contact us by completing and submitting the form below. If you are looking for a specif part number, please include it with your message.